The economy of Ireland is a knowledge economy, focused on services into high-tech, life sciences and financial services industries. Ireland is an open economy (6th on the Index of Economic Freedom), and ranks first for high-value foreign direct investment (FDI) flows. In the global GDP per capita tables, Ireland ranks 5th of 187 in the IMF table and 6th of 175 in the World Bank ranking. US multinationals contribute significantly to Ireland's economy, making up 14 of the top 20 Irish firms (by turnover), directly employing a quarter of the private sector labour-force, paying 80% of business taxes, and creating 57% of non-farm private sector OECD value-add. The "multinational tax schemes" used by these US firms contribute to a distortion Ireland's economic statistics (GNI, GNP and GDP). For example, the Organisation for Economic Co-operation and Development (OECD) shows Ireland with average leverage on a gross public debt-to-GDP basis (78.8% in 2016), but with the 2nd highest leverage, after Japan, on a gross public debt-per capita basis ($62,686 in 2016). This disconnect led to the 2017 development by the Central Bank of Ireland of Irish modified GNI (or GNI*) for measuring the Irish economy (2016 GDP is 143% of Irish 2016 GNI*, and OECD Irish gross public debt-to-GNI* is 116.5%). Ireland's GNI* per capita ranks it very similar to Germany. The distortion of Irish economic data by US multinational tax schemes, was a key contributor to the build-up of leverage in the Celtic Tiger, amplifying both Irish consumer optimism (who borrowed to 190% of disposable income, OECD highest), and global capital markets optimism about Ireland (enabled Irish banks to lend over 180% of deposit base, OECD highest). Global capital markets, who ignored Ireland's private sector credit, and OECD/IMF warnings, when Irish GDP was rising during the Celtic Tiger, took fright in the financial crisis. Their withdrawal precipitated a deep Irish property correction, which led to a crisis in the Irish banking system. The Irish financial crisis severely affected the economy, compounding domestic economic problems related to the collapse of the Irish property bubble. After 24 years of continuous growth at an annual level during 1984–2007, Ireland first experienced a short technical recession from Q2-Q3 2007, followed by a recession from Q1 2008 – Q4 2009. In March 2008, Ireland had the highest level of household debt relative to disposable income in the developed world at 190%, causing a further slow down in private consumption, and thus also being one of the reasons for the long lasting recession. The hard economic climate was reported in April 2010, even to have led to a resumed emigration. The stabilisation of the Irish credit bubble required a large transfer of debt from the private sector balance sheet (highest OECD leverage), to the public sector balance sheet (almost unleveraged, pre-crisis), via Irish bank bailouts and public deficit spending. The transfer of this debt means that Ireland, in 2017, had one of the highest levels of both public sector indebtedness, and private sector indebtedness, in the EU-28/OECD. After a year with stagnant economic activity in 2010, Irish real GDP rose by 2.2% in 2011 and 0.2% in 2012, which was mainly driven by improvements in the export sector – while private consumption remained subdued. Economic challenges continued, as the European sovereign-debt crisis caused a new Irish recession starting in Q3 2012, which was still ongoing as of Q2 2013. In May 2013 the European Commission's economic forecast for Ireland predicted its growth rates would return to a positive 1.1% in 2013 and 2.2% in 2014. The Irish economy grew by 4.8% in 2014. An apparent, but illusory, 2015 GDP growth of 26.3% (GNP of 18.7%) was officially ascribed to tax inversion practices by multinationals accessing Ireland's low tax rates. This growth, labelled 'leprechaun economics', was shown to be driven by Apple restructuring their double Irish subsidiary, ASI, in January 2015. A follow up EU Commission report into Ireland's national accounts showed that even before leprechaun economics, 23% of Ireland's GDP was multinational net royalty payments, implying Irish GDP was inflated to 130% of "true" GDP (before the Apple growth). This led to the Central Bank of Ireland proposing a new replacement metric, modified gross national income (or GNI*), to better represent the "true" Irish economy. Given the importance of US multinationals to Ireland's economy (80% of Irish multinational employment, and 14 of the 20 largest Irish firms), the passing of the Tax Cuts and Jobs Act of 2017 is a challenge to Ireland. Parts of the US TCJA are targeted at Irish multinational tax schemes (especially the move to a modern "territorial tax" system, the introduction of a lower FDII tax on intellectual property, and the counter-Irish GILTI tax regime). In addition, the EU's impending 2018 Digital Sales Tax (and stated desire for a Common Consolidated Corporate Tax Base), is also seen as an attempt to restrict the use of the Irish multinational tax schemes by US technology firms. From the 1920s Ireland had high trade barriers such as high tariffs, particularly during the Economic War with Britain in the 1930s, and a policy of import substitution. During the 1950s, 400,000 people emigrated from Ireland. It became increasingly clear that economic nationalism was unsustainable. While other European countries enjoyed fast growth, Ireland suffered economic stagnation. The policy changes were drawn together in Economic Development, an official paper published in 1958 that advocated free trade, foreign investment, and growth rather than fiscal restraint as the prime objective of economic management. In the 1970s, the population increased by 15% and national income increased at an annual rate of about 4%. Employment increased by around 1% per year, but the state sector amounted to a large part of that. Public sector employment was a third of the total workforce by 1980. Budget deficits and public debt increased, leading to the crisis in the 1980s. During the 1980s, underlying economic problems became pronounced. Middle income workers were taxed 60% of their marginal income, unemployment had risen to 20%, annual overseas emigration reached over 1% of population, and public deficits reached 15% of GDP. In 1987 Fianna Fáil reduced public spending, cut taxes, and promoting competition. Ryanair used Ireland's deregulated aviation market and helped European regulators to see benefits of competition in transport markets. Intel invested in 1989 and was followed by a number of technology companies such as Microsoft and Google. A consensus exists among all government parties about the sustained economic growth. The GDP per capita in the OECD prosperity ranking rose from 21st in 1993 to 4th in 2002. Between 1985 and 2002, private sector jobs increased 59%. The economy shifted from an agriculture to a knowledge economy, focusing on services and high-tech industries. Economic growth averaged 10% from 1995 to 2000, and 7% from 2001 to 2004. Industry, which accounts for 46% of GDP and about 80% of exports, has replaced agriculture as the country's leading sector. The economy benefited from a rise in consumer spending, construction, and business investment. Since 1987, a key part of economic policy has been Social Partnership, which is a neo-corporatist set of voluntary 'pay pacts' between the Government, employers and trade unions. The 1995 to 2000 period of high economic growth was called the Celtic Tiger, a reference to the tiger economies of East Asia. GDP growth continued to be relatively robust, with a rate of about 6% in 2001, over 4% in 2004, and 4.7% in 2005. With high growth came high inflation. Prices in Dublin were considerably higher than elsewhere in the country, especially in the property market. However, property prices were falling following the recent economic recession. At the end of July 2008, the annual rate of inflation was at 4.4% (as measured by the CPI) or 3.6% (as measured by the HICP) and inflation actually dropped slightly from the previous month. In terms of GDP per capita, Ireland is ranked as one of the wealthiest countries in the OECD and the EU-27, at 4th in the OECD-28 rankings. In terms of GNP per capita, a better measure of national income, Ireland ranks below the OECD average, despite significant growth in recent years, at 10th in the OECD-28 rankings. GDP is significantly greater than GNP (national income) due to the large number of multinational firms based in Ireland. A 2005 study by The Economist found Ireland to have the best quality of life in the world. The positive reports and economic statistics masked several underlying imbalances. The construction sector, which was inherently cyclical in nature, accounted for a significant component of Ireland's GDP. A recent downturn in residential property market sentiment has highlighted the over-exposure of the Irish economy to construction, which now presents a threat to economic growth. Despite several successive years of economic growth and significant improvements since 2000, Ireland's population is marginally more at risk of poverty than the EU-15 average and 6.8% of the population suffer "consistent poverty". It was the first country in the EU to officially enter a recession related to the Financial crisis 2008, as declared by the Central Statistics Office. Ireland now has the second-highest level of household debt in the world (190% of household income). The country's credit rating was downgraded to "AA-" by Standard & Poor's ratings agency in August 2010 due to the cost of supporting the banks, which would weaken the Government's financial flexibility over the medium term. It transpired that the cost of recapitalising the banks was greater than expected at that time, and, in response to the mounting costs, the country's credit rating was again downgraded by Standard & Poor's to "A". The global recession has significantly impacted the Irish economy. Economic growth was 4.7% in 2007, but −1.7% in 2008 and −7.1% in 2009. In mid-2010, Ireland looked like it was about to exit recession in 2010 following growth of 0.3% in Q4 of 2009 and 2.7% in Q1 of 2010. The government forecast a 0.3% expansion. However the economy experienced Q2 negative growth of −1.2%, and in the fourth quarter, the GDP shrunk by 1.6%. Overall, the GDP was reduced by 1% in 2010, making it the third consecutive year of negative growth. On the other hand, Ireland recorded the biggest month-on-month rise for industrial production across the eurozone in 2010, with 7.9% growth in September compared to August, followed by Estonia (3.6%) and Denmark (2.7%). A housing construction site in Dublin at Sandyford, 2006. The second problem, unacknowledged by management of Irish banks, the financial regulator and the Irish government, is solvency. The question concerning solvency has arisen due to domestic problems in the crashing Irish property market. Irish financial institutions have substantial exposure to property developers in their loan portfolio. In 2008, property developers had an over-supply of property, with much unsold as demand significantly diminished. The employment growth of the past that attracted many immigrants from Eastern Europe and propped up demand for property was replaced by rising unemployment. Irish property developers speculated billions of Euros in overvalued land parcels such as urban brownfield and greenfield sites. They also speculated in agricultural land which, in 2007, had an average value of €23,600 per acre ($32,000 per acre or €60,000 per hectare) which is several multiples above the value of equivalent land in other European countries. Lending to builders and developers has grown to such an extent that it equals 28% of all bank lending, or "the approximate value of all public deposits with retail banks. Effectively, the Irish banking system has taken all its shareholders' equity, with a substantial chunk of its depositors' cash on top, and handed it over to builders and property speculators.....By comparison, just before the Japanese bubble burst in late 1989, construction and property development had grown to a little over 25 per cent of bank lending." Irish banks correctly identify a systematic risk of triggering an even more severe financial crisis in Ireland if they were to call in the loans as they fall due. The loans are subject to terms and conditions, referred to as "covenants". These covenants are being waived in fear of provoking the (inevitable) bankruptcy of many property developers and banks are thought to be "lending some developers further cash to pay their interest bills, which means that they are not classified as 'bad debts' by the banks". Furthermore, the banks' "impairment" (bad debt) provisions are still at very low levels. This does not appear to be consistent with the real negative changes taking place in property market fundamentals. On 30 September 2008, the Irish Government declared a guarantee that intends to safeguard the Irish banking system. The Irish National guarantee, backed by taxpayer funds, covers "all deposits (retail, commercial, institutional and interbank), covered bonds, senior debt and dated subordinated debt". In exchange for the bailout, the government did not take preferred equity stakes in the banks (which dilute shareholder value) nor did they demand that top banking executives' salaries and bonuses be capped, or that board members be replaced. Despite the Government guarantees to the banks, their shareholder value continued to decline and on 2009-01-15, the Government nationalised Anglo Irish Bank, which had a market capitalisation of less than 2% of its peak in 2007. Subsequent to this, further pressure came on the other two large Irish banks, who on 2009-01-19, had share values fall by between 47 and 50% in one day. As of 11 October 2008, leaked reports of possible actions by the government to artificially prop up the property developers have been revealed. In November 2010 the Irish government published a National Recovery plan, which aimed to restore order to the public finances and to bring its deficit in line with the EU target of 3% of economic output by 2015. The plan envisaged a budget adjustment of €15 billion (€10 billion in public expenditure cuts and €5 billion in taxes) over a four-year period. This was front-loaded in 2011, when measures totalling €6 billion took place. Subsequent budgetary adjustments of €3 billion per year were put in place up to 2015, to reduce the government deficit to less than 3% of GDP. VAT would increase to 23% by 2014. A property tax was re-introduced in 2012. This was initially charged in 2012 as a flat rate on all properties and subsequently charged at a level of 0.18% of the estimated market-value of a property from 2013. Domestic water charges are to be introduced in 2015. Expenditure cuts included reductions in public sector pay levels, reductions in the number of public sector employees through early retirement schemes, reduced social welfare payments and reduced health spending. As a result of increased taxation and decreased government spending the Central Statistics Office (Ireland) reported that the Irish government deficit had decreased from 32.5% of GDP in 2010 (a level boosted by one-off support payments to the financial sector) to 5.7% of GDP in 2013. In addition Ireland's unemployment rate fell from a peak of 15.1% in February 2012 to 10.6% in December 2014. The number of people in employment increased by 58,000 (3.1% increase in employment rate) in the year to September 2013. On 27 February 2014 the government launched its Action Plan for Jobs 2014, which followed similar plans initiated in 2013 and 2012. The term "Celtic Phoenix" was coined by journalist and satirist Paul Howard, which has been occasionally used by some economic commentators and media outlets to describe the indicators of economic growth in some sectors in Ireland since 2014. In late 2013, Ireland exited an EU/ECB/IMF bailout. The Irish economy began to recover in 2014, growing by 4.8%, making Ireland the fastest growing economy in the European Union. Contributing factors to growth included a recovering construction sector, quantitative easing, a weak euro, and low oil prices. This growth helped to reduce national debt to 109% of GDP, and the budget deficit fell to 3.1% in the fourth quarter. The headline unemployment rate remained steady at 10%, though the youth unemployment rate remained higher than the EU average, at over 20%. Emigration had continued to play a significant factor in unemployment statistics, though the emigration rate also began to fall in 2014. Property prices also increased in 2014, growing fastest in Dublin. This was due to a housing shortage, especially in the Dublin area. The demand for housing caused some recovery in the Irish construction and property sectors. By early 2015, house price increases nationally began to outpace those in Dublin. Cork saw house prices rise by 7.2%, while Galway prices rose by 6.8%. Prices in Limerick were 6.7% higher while in Waterford there was a 4.9% increase. The housing crisis resulted in over 20,000 applicants being on the social housing list in the Dublin City Council area for the first time. In May 2015, the Insolvency Service of Ireland reported to the Oireachtas Justice Committee that 110,000 mortgages were in arrears, and 37,000 of those are in arrears of over 720 days. On 14 October 2014, Minister for Finance Michael Noonan and Minister for Public Expenditure and Reform Brendan Howlin introduced the budget for 2015, the first in seven years to include tax cuts and spending increases. The budget reversed some of the austerity measures that had been introduced over the previous six years, with increased spending and tax cuts worth just over €1bn. In April 2015, during a "Spring Economic Statement", Noonan and Howlin outlined the government's plans and projections up to the year 2020. This included policy statements on expansionary budgets, deficit management plans and proposed cuts to the Universal Social Charge and other taxes. In October 2014, German finance minister, Wolfgang Schäuble said that Germany was "jealous" at how the Irish economy had recovered after its bailout. He also said that Ireland had made a significant contribution to the stabilisation of the euro. While Taoiseach Enda Kenny praised the economic growth, and said that Ireland would seek to avoid returning to a "boom and bust" cycle, he noted that other areas of the economy remained fragile. The European Commission also acknowledged the recovery and growth, but warned that any extra government revenue should be used to further reduce the national debt. Some other commentators have suggested that, depending on the Eurozone, world economic outlook as well as other internal and external factors, the growth seen in Ireland in 2014 and early 2015 may not indicate a longer-term pattern for sustainable economic improvement. Other commentators have noted that recovery figures do not account for emigration, youth unemployment, child poverty, homelessness and other factors. On 23 June 2016, the United Kingdom voted to leave the European Union, which was widely reported as likely having a negative impact on trade between the UK and Ireland, and the Irish economy in general. Other commentators, for example the Financial Times, suggested that some London-based financial institutions might move operations to Dublin after Brexit. In 2016 official CSO figures indicated that the economic recovery had led to 26.3% growth in GDP in 2015 and 18.7% growth in GNP. The figures were widely ridiculed including by Nobel Prize winning economist Paul Krugman who labelled them "leprechaun economics". The official explanation was that the closure of the "double Irish" scheme at end 2014 (phased out by 2020), led some multinationals to relocate "intangible assets" to Ireland. It was subsequently shown in 2018 that it was due to Apple's January 2015 restructuring of their "double Irish" structure, Apple Sales International ("ASI"). While the markets had always taken Irish economic statistics with a degree of caution (given the increasing gap between Irish GNI and Irish GDP/GNP), "leprechaun economics" drew attention to the level of distortion US "multinational tax schemes" (like "double Irish") where having on Ireland's statistics. For example, on a "per capita" basis, Ireland is one of the most leveraged economies in the OECD, while on a "% of GDP" basis, it is rapidly de-leveraging. In response to this, the Central Bank of Ireland created a special steering group, the result of which was a new metric, "Modified gross national income" or "Irish GNI*", for Irish economic analysis. For 2016, Irish GNI* would be 30% below Irish GDP, while Irish Government Net Debt/GNI* would be 106% (vs. Irish Net Debt/GDP of 73%). Commentators who had been tracking the widening gap between Irish GNI and Irish GDP/GNP since the growth of the "double Irish" in the mid-2000s (see tables), and the even stronger effect of the "capital allowances for intangible assets" scheme on distorting GNI/GNP/GDP, noted that GNI* still materially over-stated the true Irish economy. By 2017, a number of Irish financial commentators bemoaned the inaccuracy of Irish economic GDP/GNP statistics. During the Irish economic crisis, specific Irish tax schemes were loosened to attract foreign capital to re-balance Ireland's debt. Schemes that were low-tax, became almost zero-tax ("capital allowances for intangible assets" in 2009). Schemes that were restricted, became more available (i.e. "Section 110 SPVs" in 2012). These schemes attracted the foreign capital that led Ireland's post-crisis recovery. It also saw Ireland rise up the league tables of corporate "tax havens", and blacklisted by Brazil. A major 2017 study into "offshore financial centers", identified Ireland as a top 5 global Conduit OFC. This made Ireland the most popular destination for US corporate tax inversions. When Pfizer and Irish-based Allergan announced the largest corporate tax inversion in history at $160bn (84% of Ireland's 2016 GNI* of €190bn), it forced the Obama administration to block US tax inversions. None have occurred since. Ireland had also become a base for US technology multinationals. By 2014 (see table), Apple's Irish ASI subsidiary was handling €34bn annually of untaxed profits (20% of Ireland's 2014 GNI*). The EU forced Ireland to close the "double Irish", but it was replaced (Apple's "capital allowances" and Microsoft's "single malt"). By 2017, IDA Ireland estimated multinationals (US comprise 80%), contributed €28.3bn in cash to the Irish Exchequer (corporate taxes, wages, and capital spend), and were responsible for an even larger Irish economic impact then could be accurately measured (i.e. new office construction, second order services etc.). The OECD estimated that foreign multinationals provide 80% of domestic value-add and 47% of employment in Irish Manufacturing, and 40% of domestic value-add and 28% of employment in Irish Services. In addition, the OECD estimate that foreign multinationals employ one quarter of the Irish private sector workforce. The US Tax Cuts and Jobs Act of 2017 was passed with Ireland directly in mind. The TCJA moves the US from the "worldwide tax" system (which is the reason why US multinationals use Ireland) to a modern "territorial tax" system (which is the reason why non-US multinationals hardly use Ireland - there are no non-US/non-UK foreign firms in Ireland's top 50 firms by turnover, and only one by employees - German retailer Lidl). The FDII tax regime gives US-based "intellectual property" ("IP") an low-tax 13.125% rate. The GILTI tax regime places a penalty on foreign-based IP (i.e. like in Ireland) that brings its effective rate above the FDII rate (i.e. incentivizes re-location of IP to the US). Experts believe that the TCJA neutralises Ireland's "multinational tax schemes". The EU Commission's impending 2018 "digital tax" is also designed to curb the Irish "multinational tax schemes". By taxing turnover, it acts as an "override" on the Irish "multinational tax schemes". It has been described by Seamus Coffey, Chairperson of the Irish Fiscal Advisory Council as "a more serious threat to Ireland than Brexit". The following table shows the main economic indicators in 1980–2017. Inflation below 2% is in green. The pharmaceutical sector employs approximately 50,000 people and is responsible for 55 billion euro of exports. [third-party source needed] A number of these companies are based in County Cork, at Little Island and Ringaskiddy. The financial services sector employs approximately 35,000 people and contributes 2 billion euro in taxes annually to the economy. Ireland is the seventh largest provider of wholesale financial services in Europe. A number of these firms are located at the International Financial Services Centre (IFSC) in Dublin. There are 1,200 directly employed in leasing, with Irish lessors managing more than €100 billion in assets. This means that Ireland manages nearly 22% of the fleet of aircraft worldwide and a 40% share of Global fleet of leased aircraft. Ireland has 14 of the top 15 lessors by fleet size. The Information and communications technology (ICT) sector employs over 37,000 people and generates 35 billion annually. The top ten ICT companies are located in Ireland, with over 200 companies in total. [clarification needed] A number of these ICT companies are based in Dublin at developments like the Silicon Docks. This includes Google, Facebook, Twitter, LinkedIn, Amazon, eBay, PayPal and Microsoft; several of which have their EMEA / Europe & Middle East headquarters in Ireland. Others operate their European headquarters from Cork, including Apple, EMC and Johnson Controls. The Multinational Engineering sector employs over 18,500 people and contributes approximately 4.2 billion euro annually. This includes approximately 180 companies in areas such of industrial products and services, aerospace, automotive and clean tech. Exports play an important role in Ireland's economic growth. A series of significant discoveries of base metal deposits have been made, including the giant ore deposit at Tara Mine. Zinc-lead ores are also currently mined from two other underground operations in Lisheen and Galmoy. Ireland now ranks as the seventh largest producer of zinc concentrates in the world, and the twelfth largest producer of lead concentrates. The combined output from these mines make Ireland the largest zinc producer in Europe and the second largest producer of lead. Ireland is the world's most profitable country for US corporations, with a corporation tax rate of 12.5% according to the US tax journal Tax Notes. The country is one of the largest exporters of pharmaceuticals, medical devices and software-related goods and services in the world. Bord Gáis is responsible for the supply and distribution of natural gas, which was first brought ashore in 1976 from the Kinsale Head gas field. Electrical generation from peat consumption, as a percent of total electrical generation, was reduced from 18.8% to 6.1%, between 1990 and 2004. A 2006 forecast by Sustainable Energy Ireland predicts that oil will no longer be used for electrical generation but natural gas will be dominant at 71.3% of the total share, coal at 9.2%, and renewable energy at 8.2% of the market. New sources are expected to come on stream after 2010, including the Corrib gas field and potentially the Shannon Liquefied Natural Gas terminal. In its Globalization Index 2010 published in January 2011 Ernst and Young with the Economist Intelligence Unit ranked Ireland second after Hong Kong. The index ranks 60 countries according to their degree of globalisation relative to their GDP. While the Irish economy has significant debt problems in 2011, exporting remains a success. The primary sector constitutes about 5% of Irish GDP, and 8% of Irish employment. Ireland's main economic resource is its large fertile pastures, particularly the midland and southern regions. In 2012 Ireland exported approximately €9 billion worth of agri-food and drink (about 8.4% of Ireland's exports), mainly as cattle, beef, and dairy products. Ireland's agri-food exports are expected to grow and are led by a number of large Irish companies including Kerry Group, Glanbia and Greencore. In the late nineteenth century, the island was mostly deforested. In 2005, after years of national afforestation programmes, about 9% of Ireland has become forested. It is still one of the least forested countries in the EU and heavily relies on imported wood. Its coastline – once abundant in fish, particularly cod – has suffered overfishing and since 1995 the fisheries industry has focused more on aquaculture. Freshwater salmon and trout stocks in Ireland's waterways have also been depleted but are being better managed. Ireland is a major exporter of zinc to the EU and mining also produces significant quantities of lead and alumina. Beyond this, the country has significant deposits of gypsum, limestone, and smaller quantities of copper, silver, gold, barite, and dolomite. Peat extraction has historically been important, especially from midland bogs, however more efficient fuels and environmental protection of bogs has reduced peat's importance to the economy. Natural gas extraction occurs in the Kinsale Gas Field and the Corrib Gas Field in the southern and western counties, where there is 19.82 bn cubic metres of proven reserves. The construction sector in Ireland has been severely affected by the Irish property bubble and the 2008-2013 Irish banking crisis and as a result contributes less to the economy than during the period 2002–2007. While there are over 60 credit institutions incorporated in Ireland, the banking system is dominated by the AIB Bank, Bank of Ireland and Ulster Bank. There is a large Credit Union movement within the country which offers an alternative to the banks. The Irish Stock Exchange is in Dublin, however, due to its small size, many firms also maintain listings on either the London Stock Exchange or the NASDAQ. That being said, the Irish Stock Exchange has a leading position as a listing domicile for cross-border funds. By accessing the Irish Stock Exchange, investment companies can market their shares to a wider range of investors (under MiFID although this will change somewhat with the introduction of the AIFM Directive. Service providers abound for the cross-border funds business and Ireland has been recently rated with a DAW Index score of 4 in 2012. Similarly, the insurance industry in Ireland is a leader in both retail markets and corporate customers in the EU, in large part due to the International Financial Services Centre. As of December 2007, Ireland's net unemployment benefits for long-term unemployed people across four family types (single people, lone parents, single-income couples with and without children) was the third highest of the OECD countries (jointly with Iceland) after Denmark and Switzerland. Jobseeker's Allowance or Jobseeker's Benefit for a single person in Ireland is €188 per week, as of March 2011. State provided old age pensions are also relatively generous in Ireland. The maximum weekly rate for the State Pension (Contributory) is €230.30 for a single pensioner aged between 66 and 80 (€436.60 for a pensioner couple in the same age range). The maximum weekly rate for the State Pension (Non-Contributory) is €219 for a single pensioner aged between 66 and 80 (€363.70 for a pensioner couple in the same age range). Total tax revenue as a percentage of GDP for Ireland over the past several decades compared to other highly developed states. From 1975 to 2005, tax revenues fluctuated at around 30% of GDP (see graph right). Before the introduction of the euro notes and coins in January 2002, Ireland used the Irish pound or punt. In January 1999 Ireland was one of eleven European Union member states which launched the European Single Currency, the euro. Euro banknotes are issued in €5, €10, €20, €50, €100, €200 and €500 denominations and share the common design used across Europe, however like other countries in the eurozone, Ireland has its own unique design on one face of euro coins. The government decided on a single national design for all Irish coin denominations, which show a Celtic harp, a traditional symbol of Ireland, decorated with the year of issue and the word Éire which means "Ireland" in the Irish language. ^ a b c d e f g h "World Economic Outlook Database, October 2018". IMF.org. International Monetary Fund. Retrieved 1 April 2019. ^ a b c d e f g h i "The World Factbook". CIA.gov. Central Intelligence Agency. Retrieved 1 April 2019. ^ "Survey on Income and Living Conditions (SILC) 2014 Results". cso.ie. Retrieved 18 December 2016. ^ "Gini coefficient of equivalised disposable income - EU-SILC survey". ec.europa.eu. Eurostat. Retrieved 1 April 2019. ^ "Quarterly National Household Survey Q3 2016". cso.ie. Retrieved 18 December 2016. ^ "Monthly Unemployment July 2018". cso.ie. 1 August 2018. ^ "CSO QuickTables - ss="p - Earnings and Labour Costs". Cso.ie. 26 November 2015. Retrieved 1 December 2015. ^ "CSO Quicktables: Earnings and Labour Costs". www.cso.ie. ^ "Ease of Doing Business in Ireland". Doingbusiness.org. Retrieved 14 January 2019. ^ a b "Goods Exports and Imports December 2017 - CSO - Central Statistics Office". Cso.ie. Retrieved 22 October 2018. ^ a b "Quarterly International Investment Position and External Debt Q3 2016". cso.ie. Retrieved 18 December 2016. ^ a b "NTMA". National Teasury Management Agency - Ireland. 2017. ^ a b "BUDGET 2018". Government of Ireland (budget.gov.ie). 2017. ^ Mac Cormaic, Ruadhán (11 October 2016). "Budget 2017: State to increase overseas aid spending to €651m". The Irish Times. Retrieved 24 December 2016. ^ "Country Statistical Profiles". OECD. Archived from the original on 24 March 2012. Retrieved 22 April 2012. ^ "Standard & Poor's raises Ireland's credit rating to A+". RTÉ. 5 June 2015. Retrieved 7 June 2015. ^ "Fitch restores A grade to Irish economy". Treasury Management Agency. Retrieved 3 March 2016. ^ "Scope affirms the Republic of Ireland's credit rating at A+; Outlook Stable". Scope Ratings. Retrieved 20 July 2018. ^ "Productivity - GDP per hour worked - OECD Data". theOECD. ^ "Ireland named best country for high-value FDI for sixth year in a row". Irish Times. 31 August 2017. ^ a b "Ireland's Top 1000 Companies". Irish Times. 2018. ^ a b c "IRELAND Trade and Statistical Note 2017" (PDF). OECD. 2017. ^ "20 multinationals paid half of all Corporation tax paid in 2016". RTE News. 21 June 2017. ^ "Most of Ireland's huge corporate tax haul last year came from foreign firms". sunday Business Post FORA. 14 May 2016. ^ "Quarterly Bulletin Comment (page 7)" (PDF). Central Bank of Ireland. April 2017. ^ a b c d "CRISIS RECOVERY IN A COUNTRY WITH A HIGH PRESENCE OF FOREIGN OWNED COMPANIES" (PDF). IMK Institute, Berlin. January 2017. ^ a b "OECD Ireland Survey 2018 (Page 34 Debt Metrics)" (PDF). OECD. March 2018. ^ a b "Net National debt now €44000 per head, 2nd highest in the World". Irish Independent. 7 July 2017. ^ a b c "Who owes more money - the Irish or the Greeks?". Irish Times. 4 June 2015. ^ a b c "Leprechaun-proofing economic data". RTE News. 4 February 2017. ^ a b "CSO paints a very different picture of Irish economy with new measure". Irish Times. 15 July 2017. ^ a b "New economic Leprechaun on loose as rate of growth plunges". Irish Independent. 15 July 2017. ^ a b c "Globalisation at work in statistics — Questions arising from the 'Irish case'" (PDF). EuroStat. December 2017. ^ a b "Lies, damned lies and the national accounts headline figures". The Irish Times. 16 December 2017. ^ "Irish Banks continue to grow deposits as loan books shrink". Irish Examiner. December 2012. ^ "IRELAND FINANCIAL SYSTEM STABILITY ASSESSMENT 2016" (PDF). International Monetary Fund. July 2016. ^ "Ireland GDP – real growth rate". Index Mundi. Retrieved 22 April 2012. ^ "Quarterly National Accounts -Quarter 1 2012" (PDF). CSO. 12 July 2012. Retrieved 12 July 2012. ^ Ambrose Evans-Pritchard (13 March 2008). "Irish banks may need life-support as property prices crash". The Daily Telegraph. London. Retrieved 13 March 2008. ^ Bowlby, Chris (13 April 2010). "Greeks and Irish look for jobs abroad". BBC News. ^ "Irish government debt four times pre-crisis level, NTMA says". 10 July 2017. ^ "42% of Europe's banking crisis paid by Ireland". 16 January 2013. ^ a b "Why do the Irish still owe more than the Greeks?". Irish Times. 7 March 2017. ^ "Ireland's colossal level of indebtedness leaves any new government with precious little room for manoeuvre". Irish Independent. 16 April 2016. ^ "Irish public debt levels 4th highest in EU28 June 2017 FAR Slide 7" (PDF). Irish Fiscal Advisory Council. June 2017. ^ "Irish household debt still amongst the highest in Europe". Irish Times. 11 September 2017. ^ "Quarterly National Accounts -Quarter 1 2013" (PDF). CSO. 27 June 2013. Retrieved 15 September 2013. ^ "European Economic Forecast Spring 2013". Economic forecasts. European Commission. 3 May 2013. Retrieved 15 September 2013. ^ "'Leprechaun Economics' Earn Ireland Ridicule, $443 Million Bill". 13 July 2016 – via www.bloomberg.com. ^ a b "Europe points finger at Ireland over tax avoidance". Irish Times. 7 March 2018. ^ "Report of the Economic Statistics Review Group". Central Statistics Office. 4 February 2017. ^ a b "Winning FDI 2015-2019 Strategy". IDA Ireland. March 2015. ^ a b "IDA Ireland Competitiveness". IDA Ireland. March 2018. ^ a b "Trump's US tax reform a significant challenge for Ireland". Irish Times. 30 November 2017. ^ a b "US corporations could be saying goodbye to Ireland". Irish Times. 17 January 2018. ^ a b "A Territorial Tax System Would Create Jobs and Raise Wages for U.S. Workers". The Heritage Foundation. 12 September 2013. ^ a b "Donald Trump singles out Ireland in tax speech". Irish Times. 29 November 2017. ^ a b "Breaking Down the New U.S. Corporate Tax Law". Harvard Business Review. 26 December 2017. ^ "MEPs approve new EU corporate tax plan which embraces "digital presence"". European Parliament. 15 March 2018. ^ a b "Shake-up of EU tax rules a 'more serious threat' to Ireland than Brexit". Irish Independent. 14 September 2017. ^ a b "Why Ireland faces a fight on the corporate tax front". Irish Times. 14 March 2018. ^ a b "EU digital levy could hit tech FDI and tax revenue here". Irish Independent. 21 March 2018. ^ O'Toole, Francis; Warrington. "Taxations And savings in Ireland" (PDF). Trinity Economic Papers Series. Trinity College, Dublin. p. 19. Retrieved 17 June 2008. ^ De Vlieghere, Martin (25 November 2005). "The Myth of the Scandinavian Model | The Brussels Journal". The Brussels Journal<!. Retrieved 9 July 2009. ^ Charles Smith, article: 'Ireland', in Wankel, C. (ed.) Encyclopedia of Business in Today's World, California, USA, 2009. ^ Guider, Ian (7 August 2008). "Inflation falls to 4.4pc". Irish Independent. Retrieved 8 August 2008. ^ "Consumer Price Index July 2008 (Dublin & Cork, 7 August 2008" (PDF). (142 KB) – Central Statistics Office. Retrieved on 8 August 2008. ^ a b "Annual Competitiveness Report 2008, Volume One: Benchmarking Ireland's Performance" (PDF). NCC. 2009. Archived from the original (PDF) on 11 May 2011. Retrieved 1 July 2009. ^ "Economic Survey of Ireland 2006: Keeping public finances on track". OECD. 2006. Retrieved 30 July 2007. ^ "House slowdown sharper than expected". RTÉ. 3 August 2007. Retrieved 6 August 2007. ^ "Latest Report: Latest edition of permanent tsb / ESRI House price index – May 2007". Permanent TSB, ESRI. Archived from the original on 28 August 2007. Retrieved 10 August 2007. ^ "EU Survey on Income and Living Conditions (EU-SILC)" (PDF). (161 KB) CSO, 2004. ^ "CSO – Central Statistics Office Ireland". Central Statistics Office Ireland. 9 November 2004. Retrieved 9 July 2009. ^ "Ireland's credit rating downgraded". RTÉ.ie. 25 August 2010. Retrieved 12 November 2010. ^ "Ireland's credit rating downgraded". irishtimes.ie. 24 November 2010. Retrieved 10 January 2011. ^ "Ireland's credit rating downgraded". standardandpoors.com. 23 November 2010. Retrieved 10 January 2011. ^ "Ireland out of recession as exports jump". The Independent. London. 1 July 2010. Retrieved 4 August 2010. ^ "Ireland out of recession but needs faster growth". BusinessDay. 1 July 2010. Retrieved 4 August 2010. ^ a b "Irish economy contracts by 1.2%". BBC News. 23 September 2010. ^ "Shrinking Irish economy heightens debt risk". Reuters. 24 March 2011. Retrieved 4 April 2011. ^ "New Eurostat website - Eurostat – Industrial production down by 0.9% in euro area and Ireland will exit its bail out program in December 2013" (PDF). epp.eurostat.ec.europa.eu. Archived from the original (PDF) on 21 September 2012. Retrieved 1 December 2015. ^ Andras Gergely (1 October 2008). "Irish finmin sees bank liquidity, not solvency issue". Reuters. ^ a b c Collins, Liam (12 October 2008). "Top developers see asset values dive two-thirds". Irish Independent. ^ "Unemployment rising at record rate". RTÉ. 1 October 2008. ^ "Irish Agricultural Land Research" (PDF). Savills Hamilton Osbourne King. May 2008. Archived from the original (PDF) on 29 October 2008. Retrieved 8 October 2008. ^ Oliver, Emmet (31 August 2008). "New waive of Irish banking". Sunday Tribune. Archived from the original on 28 February 2009. Retrieved 1 October 2008. ^ "Banks call in leading developers ahead of property write-downs". Sunday Tribune. 12 October 2008. Archived from the original on 16 October 2008. ^ "AIB Half-Yearly Financial Report 2008". Allied Irish Banks. 30 July 2008. Retrieved 18 September 2008. ^ "Reports and Accounts for the year ended 31 March 2008". Bank of Ireland. 10 June 2008. p. 73. Archived from the original on 11 July 2011. Retrieved 11 October 2008. ^ "Government Decision to Safeguard Irish Banking System". Government of Ireland, Department of the Taoiseach. 30 September 2008. ^ "Seven Deadly Sins... (of omission)". Sunday Tribune. 5 October 2008. Archived from the original on 10 October 2008. ^ "Anglo Irish directors step down, bank downgraded". Irishtimes.com. 19 January 2009. Retrieved 24 November 2010. ^ "Bank shares lose half their value in market 'carnage'". Irishtimes.com. 1 January 2009. Retrieved 24 November 2010. ^ Charlie Weston (11 October 2008). "State mortgage plan for first-time buyers". Irish Independent. Retrieved 11 October 2008. ^ "NIB figures hint at depth of bad debt problems". Sunday Tribune. 12 October 2008. Archived from the original on 19 October 2008. ^ "Extra year for Ireland under €85 billion plan". RTÉ.ie. 28 November 2010. Retrieved 3 March 2015. ^ "Govt four-year plan unveiled - As it happened - RTÉ News". rte.ie. Retrieved 1 December 2015. ^ "Budget adjustment for 2011 to total €6bn - RTÉ News". rte.ie. Retrieved 1 December 2015. ^ "Government Finance Statistics October 2014 - CSO - Central Statistics Office". cso.ie. Retrieved 1 December 2015. ^ "Live Register December 2014 - CSO - Central Statistics Office". cso.ie. Retrieved 1 December 2015. ^ "Kenny, Gilmore and Bruton on hand for job actions plan launch". Ireland News. Net. Retrieved 27 February 2014. ^ Sweeney, Tanya (19 December 2014). "Soapbox... Is the boom really back? ...and Is the so-called 'Celtic Phoenix' all it's cracked up to be?". Irish Independent. Retrieved 20 May 2015. ^ "Rise of the Celtic Phoenix?". Shelflife Magazine. 16 September 2014. ^ "Ireland is a spending nation once again as Celtic Phoenix rises". Irish Independent. 24 August 2014. ^ "GDP growth of 4.8% makes Ireland fastest growing EU economy". RTÉ News. 12 March 2015. ^ "Irish economic growth outpacing rest of Europe, says Ibec". The Irish Times. 13 April 2015. ^ "Rise of new orders for 'battered' Irish construction sector indicates recovery". Irish Independent. 10 March 2014. ^ "Strong growth sees national debt fall to 109% of GDP". Irish Times. 20 April 2015. ^ "Unemployment steady at 10% in April - CSO". RTÉ News. 29 April 2015. ^ "Ireland tops the European poll for reducing unemployment rates". The Irish Times. 30 April 2015. ^ "Population and Migration Estimates". Central Statistics Office. 26 August 2014. ^ "Emigration of Irish nationals falls 20% in year to April". The Irish Times. 26 August 2014. ^ "Property prices nationally up 15 percent in 12 months". The Irish Times. 24 September 2014. ^ "Dublin property price growth fell below national average in first three months of 2015". RTÉ News. 7 April 2015. ^ Kelly, Olivia (25 May 2015). "Dublin city social housing list tops 20,000". The Irish Times. Retrieved 25 May 2015. ^ "37,000 mortgages in arrears of over 720 days". 27 May 2015. Retrieved 28 May 2015. ^ "Budget Key Points". RTÉ News. 14 October 2014. ^ "Budget 2015: Give and take". Irish Independent. 15 October 2014. Retrieved 15 October 2014. ^ "Budget 2015: as it happened". RTÉ News. 14 October 2014. Retrieved 15 October 2014. 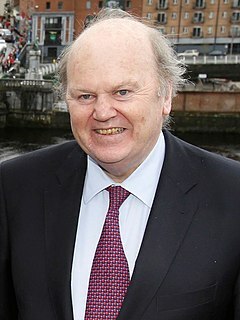 ^ "Noonan denies budget framed for election". Irish Examiner. 14 October 2014. Retrieved 15 October 2014. ^ "Budget 2015". Irish Times. 14 October 2014. Retrieved 15 October 2014. ^ "Expansionary budgets until 2020 are possible - Spring Economic Statement". RTÉ News. 28 April 2015. ^ "Spring statement: the main points". The Irish Times. 28 April 2015. ^ "Spring Economic Statement Speech by the Minister for Finance". Department of Finance. 28 April 2015. Archived from the original on 2 June 2015. ^ "German Finance Minister Wolfgang Schaeuble: 'Germany jealous of Irish growth figures'". Irish Independent. 31 October 2014. ^ "Enda Kenny says Irish economy strengthening but remains fragile". The Irish Times. 28 January 2015. ^ "No going back to boom and bust, says Kenny". The Irish Times. 9 March 2015. ^ "Enda Kenny: 2015 is the year of rural recovery". Irish Examiner. 6 March 2015. ^ Ireland's Parliamentary Budget Office: Role and Scope in the Oireachtas. Social Science Research Network (SSRN). Accessed 18 July 2017. ^ "Budget 2016: European Commission warns any extra revenues be used to cut debt". Irish Independent. 13 May 2015. ^ "The Myth of the Irish Recovery". CounterPunch. 1 May 2015. ^ "Celtic phoenix - Ireland's economy emerges from ashes". Australian Financial Review. 17 March 2015. ^ "IMF sounds warning note over economic recovery". The Irish Times. 2 May 2015. ^ "Tánaiste Joan Burton warns Ireland's economic recovery is not secure". The Irish Times. 29 April 2015. ^ "The Phoney Celtic Phoenix". Broadsheet.ie. 20 January 2016. ^ "What does 'Brexit nightmare' mean for Ireland?". The Irish Times. 24 June 2016. ^ "Britain votes to leave EU: What does it mean for Ireland?". RTÉ.ie. 23 June 2016. ^ "Brexit: Move could see flood of funds shift to Dublin - FT". The Irish Times. 16 June 2016. ^ "The real story behind Ireland's 'Leprechaun' economics fiasco". RTÉ. 25 July 2016. ^ "'Leprechaun economics' - Ireland's 26pc growth spurt laughed off as 'farcical'". Irish Independent. 13 July 2016. ^ "Meat company's relocation to Ireland unlikely to affect GDP". Irish Times. 10 August 2016. ^ "Irish GDP growth at staggering 26.3pc last year, economist says figures are 'meaningless'". Irish Independent. 12 July 2016. ^ "Irish tell a tale of 26.3% growth spurt". Financial Times. 12 July 2016. ^ "'Leprechaun economics' leaves Irish growth story in limbo". Reuters News. 13 July 2016. ^ "'Leprechaun Economics' Earn Ireland Ridicule, $443 Million Bill". Bloomberg News. 13 July 2016. ^ "Leprechaun Economics". Paul Krugman (Twitter). 12 July 2016. ^ "Economy grew by 'dramatic' 26% last year after considerable asset reclassification". RTE News. 12 July 2016. ^ a b "International GNI to GDP Comparisons". Seamus Coffey, University College Cork. 29 April 2013. ^ "Column: The Leprechauns are at it again in the latest GDP figures for Ireland". thejournal.ie. 17 March 2017. ^ "Ireland named world's 6th worst corporate tax haven". journal.ie. 12 December 2016. ^ "MANTRAS AND MYTHS: A true picture of the corporate tax system in Ireland" (PDF). RTE News. February 2017. ^ "Oxfam says Ireland is a tax haven judged by EU criteria". Irish Times. 28 November 2017. ^ "Blacklisted by Brazil, Dublin funds find new ways to invest". Reuters. 20 March 2017. ^ "Uncovering Offshore Financial Centers: Conduits and Sinks in the Global Corporate Ownership Network". Nature Magazine. 24 July 2017. ^ "Tracking Tax Runaways". Bloomberg News. 1 March 2017. ^ "Pfizer pulls out of €140bn Irish Allergan merger". Irish Independent. 6 April 2016. ^ "Bloomberg Special TAX INVERSION". Bloomberg. 2 May 2017. ^ "Brussels in crackdown on 'double Irish' tax loophole". Financial Times. October 2014. ^ "Ireland's move to close the 'double Irish' tax loophole unlikely to bother Apple, Google". The Guardian. October 2014. ^ "'Impossible' structures: tax outcomes overlooked by the 2015 tax Spillover analysis" (PDF). Christian Aid. November 2017. ^ "The United States' new view of Ireland: 'tax haven'". Irish Times. January 2017. ^ Lavassani, Kayvan (June 2018). "Data Science Reveals NAFTA's Problem" (PDF). International Affairs Forum (June 2018). Center for International Relations. Center for International Relations. Retrieved 9 July 2018. ^ "Report for Selected Countries and Subjects". www.imf.org. Retrieved 2018-09-11. ^ "Alcohol Beverage Federation of Ireland (ABFI)". ^ "Beer industry in Ireland - ABFI / Beer". ^ "Cider industry in Ireland - ABFI / Cider". ^ "Spirits industry in Ireland - ABFI / Spirits". ^ "Economic impact - ABFI / Whiskey". ^ "Wine industry in Ireland - ABFI / Wine". ^ a b "Financial Services". IDA Ireland. ^ "Aircraft Leasing & Financing. Industry in Ireland – Facts". IDA Ireland. Retrieved 2018-11-26. ^ McLoughlin, Gavin (2016-04-17). "Aircraft leasing: flying into the future". Irish Independent. Retrieved 2018-11-26. ^ "Medical Technology". IDA Ireland. ^ "Operational Irish Mines: Tara, Galmoy and Lisheen « Irish Natural Resources". Irish Natural Resources. 15 July 2008. Retrieved 9 July 2009. ^ "Ireland top location for US Multinational Profits". Finfacts.ie. Retrieved 9 July 2009. ^ Hoffmann, Kevin (26 March 2005). "Ireland: How the Celtic Tiger Became the World's Software Export Champ". Der Spiegel. Retrieved 9 July 2009. ^ a b Howley, Martin, Fergal O'Leary, and Brian Ó Gallachóir (January 2006). Energy in Ireland 1990 – 2004: Trends, issues, forecasts and indicators (pdf), p10, 20, 26. ^ "Bord Gáis Homepage". Bord Gáis. Retrieved 9 July 2009. ^ "Winning in a polycentric world: globalization and the changing world of business - The Globalization Index 2010 summary - EY - Global". ey.com. Archived from the original on 8 December 2015. Retrieved 1 December 2015. ^ World Resources Institute (2006). Forests, Grasslands and Drylands: Ireland. Archived 29 September 2007 at the Wayback Machine EarthTrends. Retrieved on 8 August 2006. ^ Heritage Council of Ireland. 1. Historical Context Archived 19 June 2007 at the Wayback Machine & 2. Ireland's Forestry Policy. Archived 19 June 2007 at the Wayback Machine Forestry and the National Heritage. Retrieved on 8 August 2006. ^ Newman, Harold R. The Mineral Industry of Ireland (pdf). U.S. Geological Survey Minerals Yearbook – 2001. ^ a b CIA (2006). Ireland The World Factbook. Retrieved on 8 August 2006. ^ Feehan, J, S. McIlveen (1997). The Atlas of the Irish Rural Landscape. Cork University Press. ^ Bord Gáis (2006). 97&3nID=354&nID=364 Natural Gas In Ireland. [permanent dead link] Gas and the Environment. Retrieved on 8 August 2006. ^ Department of Finance. Banking in Ireland Archived 9 May 2007 at the Wayback Machine Report of the Department of Finance: Central Bank Working Group on Strategic Issues facing the Irish Banking Sector. Retrieved on 7 August 2006. ^ Adkins, Bernardine and Simon Taylor, (June 2005). Banks in Northern Ireland face Competition Commission investigation Archived 28 September 2006 at the Wayback Machine (pdf). Report & Review. ^ International Monetary Fund, (20 February 2001). Insurance Supervision Report on the Observance of Standards and Codes (ROSC): Ireland. Retrieved on 8 August 2006. ^ Finfacts Ireland. . Retrieved on 10 August 2008. ^ Citizens Information. . Retrieved on 4 March 2011. ^ Central Statistics Office, Ireland (June 2006). Measuring Ireland's Progress: 2005 (pdf). ISBN 0-7557-7142-7. ^ OECD. Country statistical profiles 2006: Ireland. OECD Statistics. Retrieved on 7 August 2006. ^ Sunday Tribune. "Archived copy". Archived from the original on 8 March 2016. Retrieved 10 August 2008. CS1 maint: Archived copy as title (link). Retrieved on 10 August 2008. ^ "Design for Irish coin denominations". Myguideireland.com. Retrieved 9 July 2009. Ireland, also known as the Republic of Ireland, is a country in north-western Europe occupying 26 of 32 counties of the island of Ireland. The capital and largest city is Dublin, which is located on the eastern part of the island, and whose metropolitan area is home to around a third of the country's over 4.8 million inhabitants. The sovereign state shares its only land border with Northern Ireland, a part of the United Kingdom. It is otherwise surrounded by the Atlantic Ocean, with the Celtic Sea to the south, St George's Channel to the south-east, and the Irish Sea to the east. It is a unitary, parliamentary republic. The legislature, the Oireachtas, consists of a lower house, Dáil Éireann, an upper house, Seanad Éireann, and an elected President who serves as the largely ceremonial head of state, but with some important powers and duties. The head of government is the Taoiseach, who is elected by the Dáil and appointed by the President; the Taoiseach in turn appoints other government ministers. The Isle of Man, one of the Crown dependencies, is a low-tax economy and offshore financial centre. Located in the Irish Sea, it is within the British Isles but does not form part of the United Kingdom or the European Communities. A corporate haven, corporate tax haven, or multinational tax haven, is a jurisdiction that multinational corporations find attractive for establishing subsidiaries or incorporation of regional or main company headquarters, mostly due to favourable tax regimes, and/or favourable secrecy laws, and/or favourable regulatory regimes. The Central Bank of Ireland is the Republic of Ireland's central bank, and as such part of the European System of Central Banks (ESCB). It is the country's financial services regulator for most categories of financial firms. It was the issuer of Irish pound banknotes and coinage until the introduction of the euro currency, and now provides this service for the European Central Bank. This page is a list of the countries of the world by gross domestic product per capita, i.e., the purchasing power parity (PPP) value of all final goods and services produced within a country in a given year, divided by the average population for the same year. This page lists the countries of the world sorted by their gross domestic product per capita at nominal values. This is the value of all final goods and services produced within a nation in a given year, converted at market exchange rates to current U.S. dollars, divided by the average population for the same year. The International Financial Services Centre (IFSC) began in 1987 as a special economic zone on a derelict 11-hectare site in central Dublin, with EU approval to apply a 10% corporate tax rate for "designated financial services activities" on the site. Before the expiry of this EU approval in 2005, the Irish Government legislated in 1998/99 to effectively "turn the entire country into an IFSC" by reducing the overall Irish corporate tax rate from 32% to 12.5%. The legal requirement for a specific IFSC geographic area was thus removed, and the term International Financial Services ("IFS") sector is now used to cover the IFSC. Ireland's Corporate Tax System is a central component of Ireland's economy. In 2016–17, foreign firms paid 80% of Irish corporate tax, employed 25% of the Irish labour force, and created 57% of Irish OECD non-farm value-add. U.S.–controlled firms represent almost all foreign firms in Ireland and in 2017 were 25 of the top 50 Irish firms, and 70% of the revenue of the top 50 Irish firms. By 2018, Ireland had received the most U.S. § Corporate tax inversions in history, and Apple was over one–fifth of Irish GDP. Academics rank Ireland as the largest tax haven; larger than the Caribbean tax haven system. Taxation in the Republic of Ireland in 2017 came from Personal Income taxes, and Consumption taxes, being VAT and Excise and Customs duties. Corporation taxes represents most of the balance, but Ireland's Corporate Tax System (CT) is a central part of Ireland's economic model. Ireland summarises its taxation policy using the OECD's Hierarchy of Taxes pyramid, which emphasises high corporate tax rates as the most harmful types of taxes where economic growth is the objective. The balance of Ireland's taxes are Property taxes and Capital taxes. The Irish property bubble was the overshooting part of a long-term price increase of real estate in the Republic of Ireland from the late 1990s to 2007, a period known as the Celtic Tiger. In 2006 the prices peaked at the top of the bubble, with a combination of increased speculative construction and rapidly rising prices; in 2007 the prices first stabilised and then started falling until 2010. By the second quarter of 2010, house prices in Ireland had fallen by 35% compared with the second quarter of 2007, and the number of housing loans approved fell by 73%. Dublin is the largest city and capital of Ireland, and is the country's economic hub. As well as being the location of the national parliament and most of the civil service, Dublin is also the focal point of media in the country. Much of Ireland's transportation network radiates from the city, and Dublin Port is responsible for a large proportion of Ireland's import and export trade. The post-2008 Irish economic downturn in the Republic of Ireland, coincided with a series of banking scandals, followed the 1990s and 2000s Celtic Tiger period of rapid real economic growth fuelled by foreign direct investment, a subsequent property bubble which rendered the real economy uncompetitive, and an expansion in bank lending in the early 2000s. An initial slowdown in economic growth amid the international financial crisis of 2007–08 greatly intensified in late 2008 and the country fell into recession for the first time since the 1980s. Emigration, as did unemployment, escalated to levels not seen since that decade. Leprechaun economics is the term used by Nobel Prize-winning economist Paul Krugman to describe the 26.3 per cent increase in Irish 2015 GDP, that was later revised to 34.4 per cent, in a 12 July 2016 publication by the Irish Central Statistics Office restating 2015 Irish national accounts. Leprechaun economics: Ireland reports 26 percent growth! But it doesn't make sense. Why are these in GDP? Conduit OFC and Sink OFC is an empirical quantitative method of classifying corporate tax havens, offshore financial centres and tax havens. On 29 August 2016, after a two-year investigation, Margrethe Vestager of the European Commission announced: "Ireland granted illegal tax benefits to Apple". The Commission ordered Apple to pay €13 billion, plus interest, in unpaid Irish taxes from 2004–14 to the Irish State. It was the largest corporate tax fine in history. On 7 September 2016, the Irish State secured a majority in Dail Eireann to reject payment of the back-taxes, which including penalties, could reach €20 billion, or 10% of 2014 Irish GDP. In November 2016, the Irish State formally appealed the ruling, claiming there was no departure from Irish taxation law, and that the Commission's action was "an intrusion into Irish sovereignty", as national tax policy is excluded from EU treaties. In November 2016, Apple CEO Tim Cook, announced Apple would appeal, and in September 2018, Apple lodged €13 billion to an escrow account, pending appeal. Modified gross national income, Modified GNI or GNI* was created by the Central Bank of Ireland in February 2017 as a new way to measure the Irish economy, and Irish indebtedness, due to the considerable distortion that the base erosion and profit shifting ("BEPS") tools of U.S. multinational tax schemes, were having on Irish GNP and Irish GDP. While a "distorted GDP-per-capita" is a known feature of corporate–tax havens, Ireland was the first to replace its GDP/GNP metrics. Ireland is sometimes labelled a corporate tax haven, an allegation which it rejects. Ireland's base erosion and profit shifting ("BEPS") tools give some foreign corporates § Effective tax rates of 0% to 3% on global profits re-routed to Ireland via Ireland's tax treaty network. Ireland's aggregate § Effective tax rates for corporates is circa 2–4%. Ireland's BEPS tools are the world's largest BEPS flows, exceed the entire Caribbean system, and artificially inflate the US–EU trade deficit. Ireland's QIAIF & L–QIAIF regimes, and Section 110 SPVs, enable foreign investors to avoid Irish taxes on Irish assets, and can be combined with Irish BEPS tools to create confidential routes out of the Irish corporate tax system. As these structures are OECD–whitelisted, Ireland uses data protection, data privacy laws, and opt-outs from filing of public accounts, to obscure their effects. There is evidence Ireland acts as a § Captured state fostering tax avoidance strategies.